Ian Edginton and I.N.J. 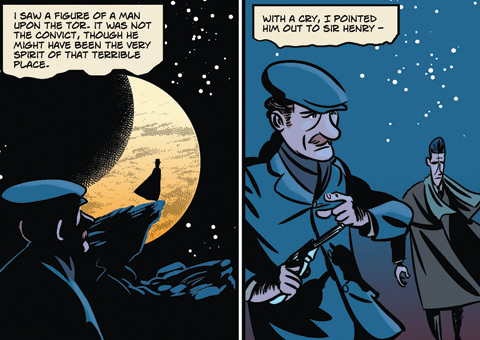 Culbard have teamed up again to create a visually compelling graphic novel adaptation of Arthur Conan Doyle’s masterpiece. 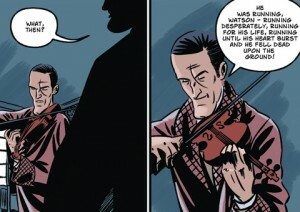 And the superb writing and beautiful art takes Conan Doyle’s supernatural tale to new heights. All the elements are here for a thrilling tale: A gnarled walking stick, missing boot, neglected family portrait, convicted killer on the loose, and the ancestral curse of a phantom hound. The great detective himself, Sherlock Holmes—with the help of Dr. Watson has his work cut out for him in a dramatic mystery that will keep readers guessing until the very end. 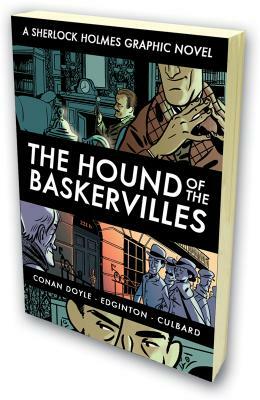 This is a graphic adaptation of a very famous work by Sir Arthur Conan Doyle, and as such Ian Edginton had his work cut out for him. Details and descriptions of people, environment and background are left to the artist and the writer distills what’s needed to give the readers an excellent story. In that Edginton has done a wonderful job. We have 127 pages of story that deliver the Sherlock Holmes tale of murder, mystery and the supernatural. Having read and re-read all of Holmes adventures I wasn’t expecting many surprises from the story but the art was what I looked forward to. 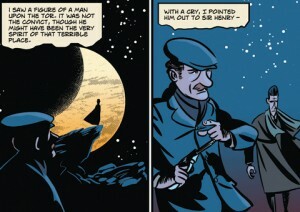 Culbard has a wonderful style and sense of style that brilliantly captures and presents 19th century England. The characters all have a roundness in their head and faces that don’t feel cartoonish because of the wonderful expressions illustrated. More than any other element colour tells the story for us in its wonderful use from page to page. It’s handsome book: 6.5×8.5″ softcover, heavy paper stock, a solid work. 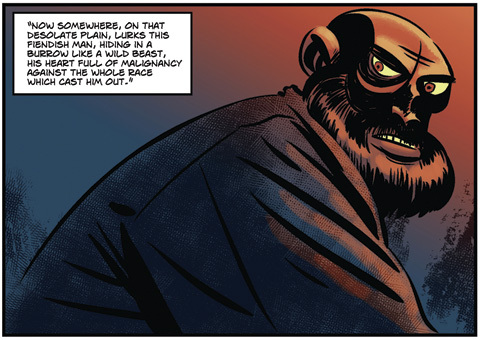 For extras we have Culbard’s character studies and a preview of the next Holmes adaptation. This volume was published by SelfMadeHero in the United Kingdom but distribution for North America is handled by Sterling. A solid work from a creative team to watch.